Rich and Max Rodenburg of Nebraska Home Sales are 2014 Project Partners for the Lincoln Cares program, which allows customers of the Lincoln Electric System (LES) to add $1 to their monthly bill payments for Parks and Recreation, Lincoln City Libraries and Aging Partners’ projects and programs throughout the community. The Rodenburgs and Nebraska Home Sales provided matching dollars to help fund Haines Branch Prairie Corridor. The Prairie Corridor is a 7.5-mile corridor that will link Pioneers Park with Spring Creek Prairie and provide enhancement and preservation of tall grass prairie, recreational and educational connections and economical development opportunities. In addition to Nebraska Home Sales and Lincoln Cares donations, this project also received support from the Lincoln Parks Foundation and Prairie Corridor Partnership. From its inception in February 2003, Lincoln Cares has collected more than $700,000 in donations from LES customers. Another $560,936 has been contributed through direct donations to the Lincoln Parks Foundation and through community partnerships with local foundations, businesses and neighborhood associations. The total for all collections since Lincoln Cares exceeds $1.26 million. LES customers who currently add $1 to their utility bills on a month-by-month basis for Lincoln Cares now need to enroll in the program to have their donation automatically included on their LES bill. To enroll, go to: les.com/lcdonate or call 402-475-4211. Donations also can be made online at LincolnCares.org. For more information on Lincoln Cares, go to: lincolncares.org. 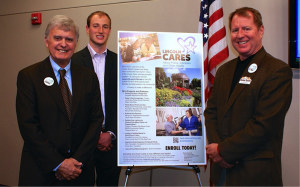 Mayor Chris Beutler thanks Max Rodenburg and Rich Rodenburg of Nebraska Home Sales its matching support for the Haines Branch Prairie Corridor. This project is part of the 2014 Lincoln Cares community donation program, which allows LES customers to add $1 to their monthly bill payments for Lincoln Parks and Recreation, Lincoln City Libraries and Aging Partners’ projects and programs. To enroll, go to: les.com/lcdonate or call 402-475-4211. Donations also can be made online at LincolnCares.org. For more information on Lincoln Cares, go to: lincolncares.org.